The exhibition “Naturally” brings together 4 artists whose work explores the ever-changing relationship Americans have with the natural world. This multi-dimensional exploration takes on the dichotomy of the human impact on the environment, coupled with our relationship to technology. How does our increasingly integrated virtual experience in our everyday lives impact our understanding and relationship to nature? How do we integrate or detach from nature? Some of the works in the exhibit go to the heart of these ideas, while others blur the line between man-made and natural. All of the artists explore these ideas through ceramic material using a variety of processes and techniques. Participating artists: Susan Beiner (AZ), John Byrd (FL), Patsy Cox (CA), and Jason Walker (WA). Curated by Ben Ahlvers. What separates human from animal? What borders exist between the real and the imagined, the beautiful and the repugnant, the living and dying, the creator and the made? Through the act of making, I swim in and around these margins, revealing how slippery the answers to these questions are. I create animals that blur species boundaries. They challenge the perceived order and comfortable classifications of life. These animals are tricksters; familiar but also alien, seductive but also scary, animal but also human, alive but also dead. In a world where petals mimic fur and hair impersonates bone, even materials upset their expected roles. These creatures are not to be trusted, for as soon as we identify with them, we admit that perhaps the definitions they upturn are not so clearly defined as we would like to think. Many of the pieces on display at the Lawrence Arts Center represent Lindsay’s newest works. Lindsay Pichaske (b. 1981) received her MFA from the University of Colorado, Boulder and her BFA from the University of North Carolina, Chapel Hill. Her work is exhibited throughout the country, including SOFA Chicago, Duane Reed Gallery in St, Louis, Foster/White Gallery in Seattle, and Flashpoint Gallery in Washington, DC. Prior to moving to Maryland, she was a long-term resident artist and Taunt Fellow at the Archie Bray Foundation for Ceramic Arts (2011-2012). 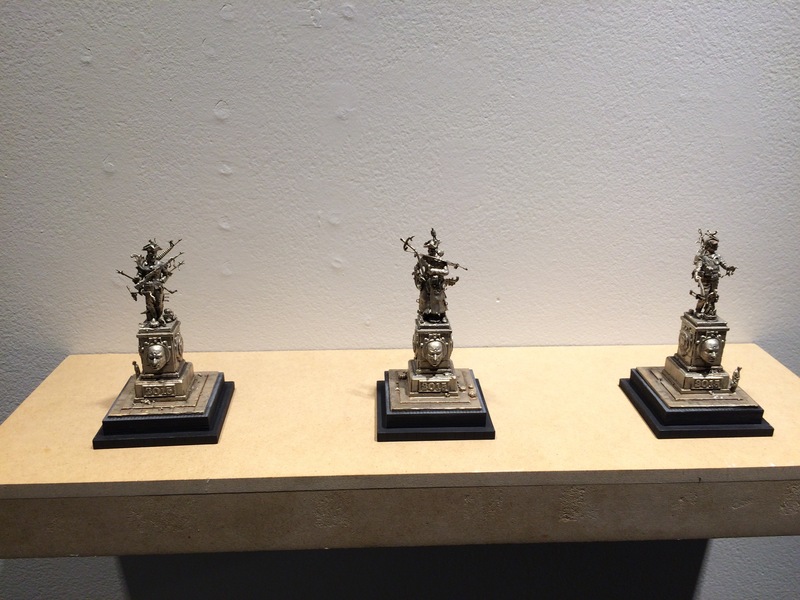 In 2013, Pichaske received an “Emerging Artist” Award from the National Council on Education for the Ceramic Arts. Most recently, she is the recipient of the Maryland State Arts Council Individual Artist Award. She currently teaches at the Maryland Institute College of Art, and is a Ceramics faculty member and area coordinator at the College of Southern Maryland. This exhibition will be on display from January 16 – March 19, 2016. Stay tuned: the exhibition will evolve as our 2016 Benefit Auction approaches. The Lawrence Arts Center is proud to work with Kris Kuksi as our 2016 Featured Artist, and we will unveil additional pieces created by Kris especially for the Auction Exhibition opening in March. The April 23rd Benefit Art Auction will feature over 150 works of art, and all proceeds support the Exhibitions Program. Kris Kuksi garners wide acclaim for intricate sculptures that result from his unique and meticulous technique. His process involves countless hours of assembling, collecting, manipulating, cutting, and re-shaping thousands of individual parts, finally uniting them into orchestral and seamless wholes that define the historical rise and fall of civilizations and envision the possible futures of humanity. 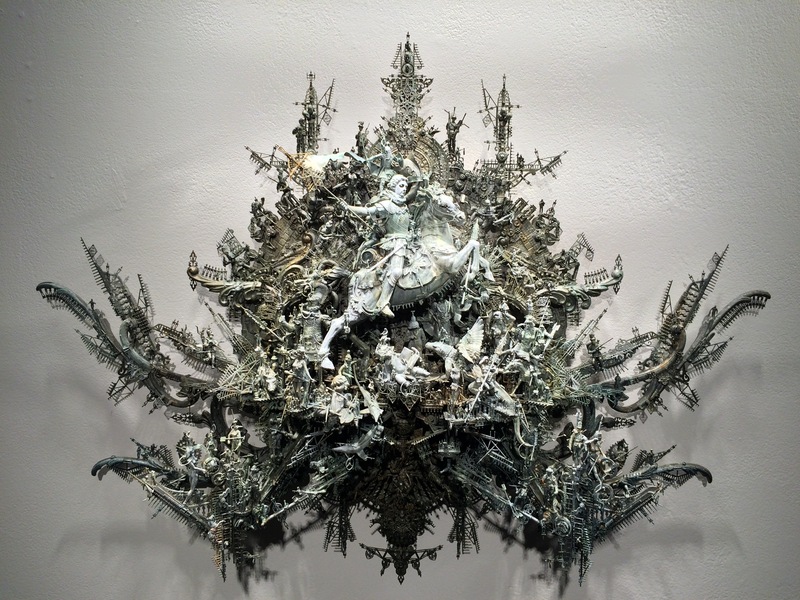 Each sculpture embodies the trademarks of his practice, while serving as a testament to the multifaceted nature of perception, from iconic references of Gods and Goddesses, to challenging ideas of organized religion and morality, to the struggle to understand and bend the limits of mortality. None is complete without a final and brilliant touch of Kuksi satire and rebuke, all conceived in the aesthetic essence of the Baroque fused with the modern day industrial world.